Tis the season! We recently commemorated the Jewish Festival of Lights (Hanukkah), and as believers, we know that Jesus Himself is the Light of the World (John 8:12, John 9:5). Our sights now turn toward Christmas and the celebration of the birth of our Savior who is Christ the Lord. But let’s get practical for a few days to consider some physical facts about Jesus’ birth and humanness. Perhaps we forget that Jesus was physically born into this world just as we were, and faced the same challenges that we face. True, He was sinless and we are not, but that does not change the fact He was fully man as well as fully God. Mark 6:3 and Matthew 13:55 clearly identify Jesus as a carpenter, and the son of a carpenter. Some would dispute that fact, arguing that the Greek word tekton, translated “carpenter,”could mean something different, such as “stone mason.” It is not a salvation issue, so I prefer not to be dogmatic. However, a widely accepted definition of tekton is “artisan”or “craftsman.” While not divinely inspired, early historical writings also distinguish Jesus as an apprentice woodworking craftsman of His earthly father, Joseph. Together, they made things such as ploughs and yokes out of wood. Elisha – He was plowing a field when Elijah called him into ministry (1 Kings 19). Plowing entails removing rocks, planting seeds and bringing about growth…which is exactly what Elisha was called to do! Gideon – While separating wheat from chaff, God called him to “weed out” his army (Judges 7), then sift Israel’s enemies. His vocation prepared him for the purpose God had for him. David – A lowly shepherd boy, tending sheep in a hostile environment (1 Samuel 17). He fought wild beasts,protected the flock, cared for them, and ultimately used his skills to slay a giant. What perfect training for the calling God had on his life! The disciples – Many were fishermen, and you know the analogy! Some of Jesus’ great miracles had to do with miraculous catches of fish. They would become miraculous fishers of men, and thousands would come to faith as their vocation had prepared them! Likewise, Jesus was born with a purpose and God the Father knew exactly in what “vocation” His Son would be raised to excellence! In a manger in the city of David, a Savior was born, and we celebrate the birth of that carpenter’s son as Jesus, our Savior and King! I hope you’ll stick around over the next few days as we look at what Scripture says about Jesus and the vocation prepared for Him by His Father. Amen I agree and what are your thoughts on the whole Christmas is pagan why can’t we all as Christians agree on the things we agree on and with and not the things we don’t agree on and with? It is a time of year to share the Gospel with the the lost. Thanks for your comments, Bibleguy! I take care in addressing whether or not Christmas is pagan. While there are some elements that have definitely made Christmas a materialistic occasion, I like to preserve the traditional intent of the Christmas celebration. At its root, Christmas is a celebration of the birth of Jesus our Savior (though His birth very likely did not occur on December 25). The point is not whether or not the day and the details are perfectly identified, but that the birth of Jesus is honored. Had He not been born, we would have no means of salvation. 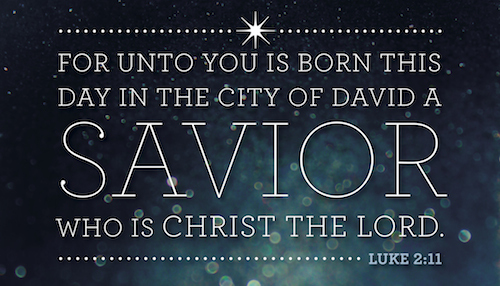 Thus, we celebrate His birth! Meanwhile, I believe we are wise to focus on the true meaning of Christmas…and stick to it…rather than fall into the trap of commercial materialism. Finally, Amir Tsarfati provided an excellent teaching on the celebrations of Hanukkah and Christmas. I encourage you to take a look (link below), as you will be blessed! Merry Christmas! Your welcome yes I agree it just gets old the same thing every year when Believers in Christ say Christmas is pagan. Merry Christmas to you too. Why can’t we focus on the things we can and do agree on and with and not the things we don’t agree on and with.